Last major update issued on February 12, 2004 at 05:20 UTC. The geomagnetic field was quiet to major storm on February 11. Solar wind speed ranged between 341 and 468 km/sec. Solar wind density began to increase at 0930 UTC at ACE. From 11 until 18h UTC the interplanetary magnetic field was moderately to strongly southwards (causing minor to major geomagnetic storming), then swung northwards for the remainder of the day. This disturbance appears to be preceding the high speed stream from coronal hole CH80. Solar wind speed has increased above 600 km/sec as I write this with strong southwards fluctuations observed. Solar flux measured at 20h UTC on 2.8 GHz was 114.2. The planetary A index was 26 (STAR Ap - based on the mean of three hour interval ap indices: 26.3). Three hour interval K indices: 21145652 (planetary), 20235553 (Boulder). At midnight there were 6 spotted regions on the visible disk. Solar flare activity was very low. No C class events was recorded during the day. Region 10549 became spotless early in the day. Then the plage in the region brightened and a new spot emerged. The region will rotate out of view at the northwest limb today. Region 10551 decayed further with small spots and nearly half of the penumbral area disappearing. Region 10554 decayed slowly and was quiet. Region 10555 was quiet and stable. New region 10556 emerged in the northeast quadrant on February 9 and was numbered by SEC two days later. The region developed slowly on February 11. Interestingly a patch of negative polarity flux emerged in the middle of the leading positive polarity area. [S351] This region emerged on February 11 in the central western part of coronal hole CH80 near the center of the visible disk. Location at midnight: S09W06. 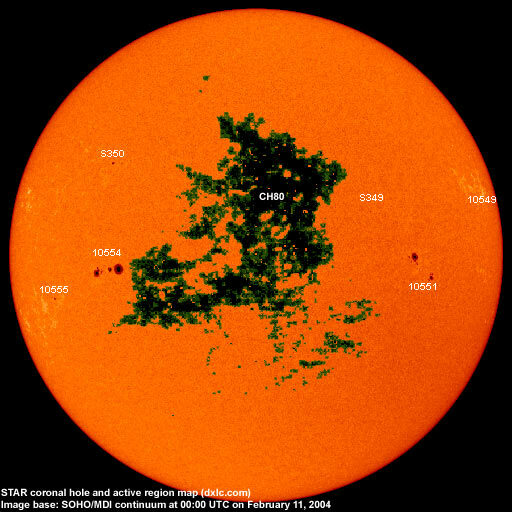 February 9-11: No partly or fully earth directed CMEs observed. 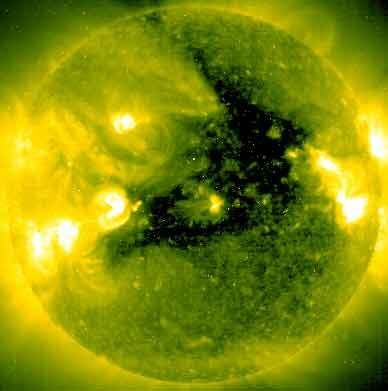 A recurrent trans equatorial coronal hole (CH80) was in a geoeffective position on February 9-12. 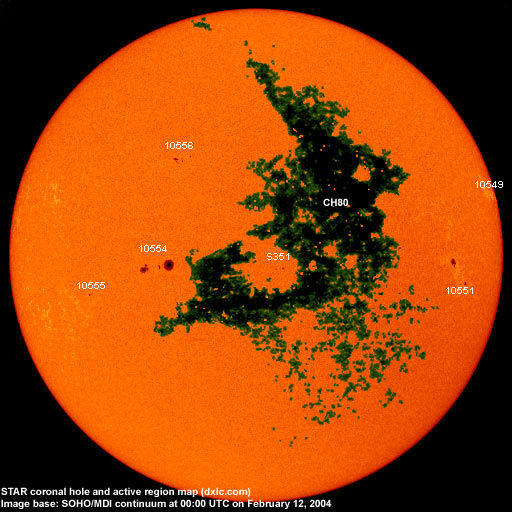 The geomagnetic field is expected to be unsettled to minor storm on February 12-13 and unsettled to active on February 14-15 due to a high speed stream from coronal hole CH80. Long distance low and medium frequency (below 2 MHz) propagation along east-west paths over high and upper middle latitudes is very poor. Propagation along long distance north-south paths is fair. [Trans Atlantic propagation conditions are currently monitored every night on 1470 kHz. Dominant stations tonight: Radio Cristal del Uruguay and Radio Vibración (Venezuela), both stations were noted at midnight. At that time quite a few stations from Brazil had strong signals, i.e. Metropolitana on 930, Bandeirantes on 1360 and an unidentified station on 1500 (unfortunately with a soccer commentary)].